...For Bonhoeffer [in his book, The Cost of Discipleship], grace is about God's unconditional 'Yes' in the person of Jesus Christ, His call for us to be commtted to him [as a disciple] is wrapped up in his commitment to us. All of our striving is within the context of our belonging, reminiscent of Paul's comment, 'I press on to make it my own because Christ Jesus has made me his own.' 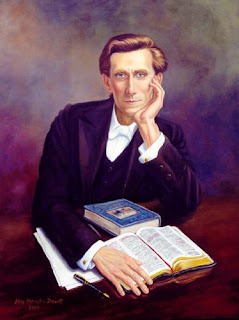 ...When Christ calls a person to obey it means taking off the heavy yoke and putting on the light one. 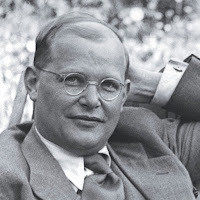 Discipleship is not about a power struggle, but about a love relationship... For Bonhoeffer, the motivation to follow and the empowerment to obey derive from the joy of grace..." (pp. 96-97, emphasis added). It is an error to read legalism into Bonhoeffer's call to discipleship. He was a careful and passionate proponent of the grace-based, Trinitarian, incarnational theology that he learned from Karl Barth and through his own study of Scripture and the early church fathers. For Bonhoeffer (like Barth), discipleship is grounded in and fundamental to the grace of God that is ours in union and communion with Jesus. The life of grace with Jesus is the life of being his disciple. It is by grace alone that Jesus, out of his abundance, enables us through his Spirit to share in his life - a life of ministry with Jesus. Our calling and challenge is to surrender to Jesus, walk in his Spirit, and thus participate in what he is now doing. The life of being a disciple of Jesus is joy and freedom in the Spirit, not legalistic duty. It entails radical, single-minded following of Jesus - not a program, religion, or cause (no matter how noble). It's not even a life of following Jesus as a concept, historic figure or good moral example. Instead, it is the outworking of our personal union with Jesus, in the Spirit - a union that deepens into communion as we share, through the Spirit, in what Jesus is doing in our world to fulfill the Father's mission. Jesus' life becomes our life; his mission and ministry our life work. To paraphrase T.F. Torrance: It's all of grace, and all of grace includes all of us. I believe this is what true discipleship is. It is a relationship of love and surrender to the One who loved and surrendered for our sakes. As Paul said, "For the love of God compels us." Discipleship is not a list of do's and dont's but a passionate devotion to and a fierce trust in Jesus which leads one to an imitation of his life and being.